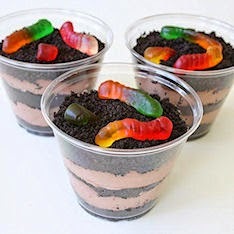 Since Spring is here, let's make some "Dirt Cups" for a great Spring snack! The kids are gonna love it! Note: The kids will love to do this if you put them in a zippy bag and give them a wooden mallet or a rolling pin! 2. Mix milk and pudding in a large bowl. Beat with a whisk until well blended. Let stand for 5 minutes. Yes, the kids can do ALL of this! Remember, you're their "assistant!" 3. Add whipped topping and half of the crushed cookies. 4. Place 1 Tablespoon of the cookie crush in the bottom of each plastic cup. 5. Fill cups about 3/4 full with pudding mixture. 6. Sprinkle with the remaining cookie crush mixture. Note: Make sure the cookies are crushed to look like "dirt!" 7. Chill about an hour. 8. When ready to serve let the kids decorate with worms and frogs! Don't be surprised if dirt cups become one of their favorite treats.